They're no Bill and Ted, but Jennifer Holder and Shawanda Mason-Moore are about to embark on an excellent adventure. Make that "eggcellent adventure." The Chattery's operations headmaster and creative director, respectively, actually hatched the idea last year, so this is a sequel, of sorts, for the Great Adult Egg Hunt and Hoppy Hour. Last year eggceded eggspectations, so they're hoping for similar success. › When: Saturday, April 20; hunt 2-4 p.m., restaurant hop, 4-6 p.m.
Set for Saturday, the egg hunt takes place from 2 to 4 p.m. at Sculpture Fields, and Hoppy Hour will follow from 4 to 6 p.m. at several restaurants along Main Street. The hunt will put thousands of eggs into play. Most are the cheap kind, made of plastic, but they'll be filled with candy and redeemable coupons. About 70 are actual Grade A works of art. About a month ago, blank wooden eggs were made available for local artists to add their unique designs. That incubation period ended Saturday, so now it's time to get cracking. 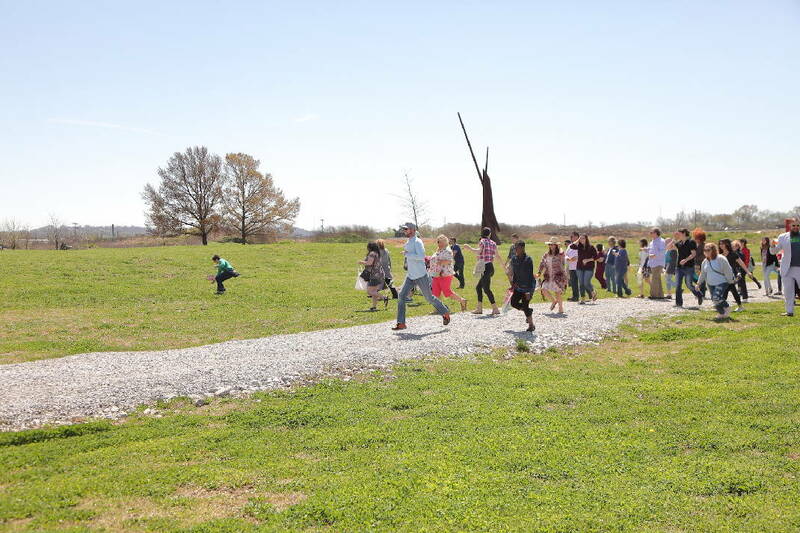 In this final week before the hunt, Holder and Mason-Moore are concentrating on signing up adults to find the eggs, which will be hidden around the 33-acre park and its nearly 50 large-scale sculptures. They emphasize that this is a hunt for adults, so the pecking order will be the reverse of most hunts this weekend. Meaning: Mother hens might take this as an opportunity to fly the coop for a couple of hours since the little nuggets will be eggscluded from this hunt. Kids who do show up will have coloring pages to keep them entertained. Holder says about 300 adults participated last year and seemed eager to join the scramble. "People were running last year to find the eggs," she says. "A lot of people had a great time even if they couldn't find an artist egg." You can take home as many plastic eggs as you can find, but you'll be limited to eggsactly one artist's egg, even if you find a dozen. And if you shouldn't find any, be glad for the eggsercise. The hunt has other eggstras, such as tunes by DJ MCPro and products for sale by local restaurants and vendors, including beer from The Bitter Alibi, food from Amaizeing Eats, coffee from Frothy Monkey and clothing by Blood Thirsty Vintage. And you can eggspect more fun during Hoppy Hour. The eggspense is minimal: just $7 in advance, $10 day of. Visit www.greatadultegghunt.com for more information.